Three Police officers cheated death following an incident where a digger had brought down a power line during a routine stop along Princes Road on Tuesday afternoon. Police Constable (PC) Jeremaia Balemaira of the Eastern Division Highway Division was hit by an electric shot while attending to a case of dangerous driving along Princes Road while fellow officers, Special Constable Mosese Gasaudrokadroka and PC Aliposo Steven narrowly escaped when a digger brought down a power line along Princes Road. The three officers were conducting patrols as part of Operation Tatarovi II when they pursued a vehicle that was driving in a dangerous manner. They stopped the vehicle near Zalim Street when suddenly a truck loaded with a digger and driven by a 43-year-old man drove past the three and the arm of the machine brought down a nearby powerline. The power line landed on the back of PC Balemaira’s neck followed by what he described as a shock that ran through his body causing him to lose consciousness while the other two officers managed to jump away in the nick of time. 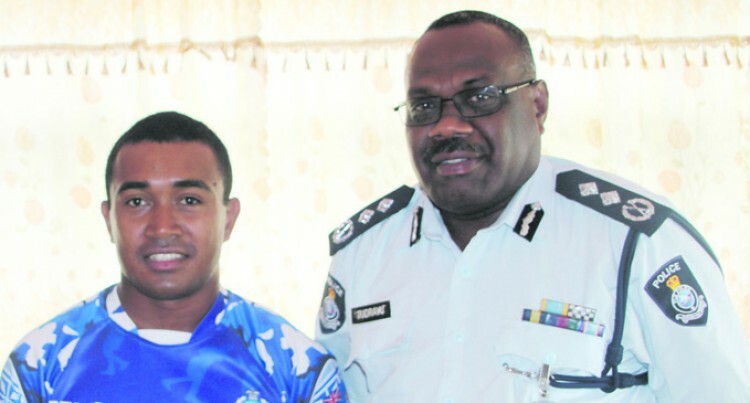 Recalling the incident in his home yesterday in the presence of the Acting Commissioner of Police Rusiate Tudravu and Force Chaplain Reverend Isireli Kacimaiwai, the 25-year-old officer said he was fortunate to survive the accident. “I consider myself very lucky to be alive and I thank the Almighty God for his protection”. “I only came to realise what had happened when I regained consciousness in hospital and I am glad that no one was seriously injured or had lost their life because it could have turned out worse”. Acting Commissioner of Police Rusiate Tudravu said the institution was relieved that no one was seriously injured or had lost their life in the accident yesterday. “The work of a Police officer is dangerous and we never know what a day has in store for us and the fact that all three of you were able to escape without any serious injuries is a huge relief”. Investigations will be looking into the negligent and reckless actions of the driver and whether he had complied with regulations when transporting heavy machinery. The driver is being questioned at the Nausori Police Station.